He was born in Virden, Illinois. His father was a farmer. He attended Coe College and graduated in 1887. After two years as an instructor at a business school, the Fort Dodge Commercial Institute, he went to Germany for graduate study at the University of Berlin. 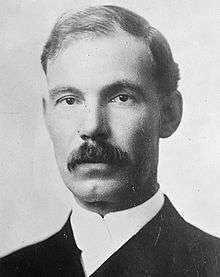 He returned to the U.S., and in 1891 he received his Ph.D. from Johns Hopkins University in political economy, with minors in philosophy and ethics. In response, Jane Stanford called for his resignation. In Ross' public statement as to his resignation, he wrote about how his good friend, Dr. Jordan, was the one who asked him to make the unfortunate speech in the first place, which ended up being surrounded with so much controversy. Jordan managed to keep Ross from being fired, but Ross resigned shortly after. The position was at odds with the university's founding family, the Stanfords, who had made their fortune in Western rail construction, a major employer of coolie laborers. From 1900 to the 1920s, Ross supported the alcohol Prohibition movement as well as contunuing to support eugenics and immigration restriction. By 1930, he had moved away from those views, however. ↑ Weinberg, Julius (1972). Edward Alsworth Ross and the Sociology of Progressivism, State Historical Society of Wisconsin. ↑ Hertzler, J. O. (1951). "Edward Alsworth Ross: Sociological Pioneer and Interpreter," American Sociological Review, Vol. 16, No. 5, pp. 597-613. ↑ "The findings of the eugenicists quite naturally gave support to the opponents of further immigration. One of the most widely read books on this controversial issue was The Old World in the New, by Edward A. Ross [...] he believed in the conventional myth of Nordic supremacy and the need for a program of positive eugenics in order to preserve our Anglo-Saxon Americanism against pollution through immigration [...] [ending] with a chapter showing how 'Immigrant Blood' was slowly polluting the purer 'American Blood', as 'beaten members of the beaten breeds' swarmed over the beloved land of his own pioneer ancestors. Somewhat obsessed with race, Ross was of course convinced that 'the blood being injected into the veins of our people was sub-human'; the newer immigrants were 'morally below the races of northern Europe'; and that it all would end in 'Race Suicide'." — Baltzell, E. Digby (1964). The Protestant Establishment: Aristocracy and Caste in America. Random House, p. 105. ↑ Rafter, Nicole H. (2009). "Edward Alsworth Ross: The System of Social Control, 1901," in The Origins of Criminology: A Reader, Routledge, p. 320. 1 2 "Edward A. Ross, President 1914-1915". ↑ Casper, Gerhard (1995). Die Luft der Freiheit weht - On and Off. Stanford University, Office of the President. ↑ Mohr, James C. (1970). "Academic Turmoil and Public Opinion: The Ross Case at Stanford," Pacific Historical Review, Vol. 39, No. 1, pp. 39-61. ↑ Riley, Naomi Schaefer (2011). The Faculty Lounges and Other Reasons Why You Won't Get the College Education You Paid For, Lanham, Maryland: Ivan R. Dee, p. 34. ↑ Stanford University. The Independent (New York). ↑ Burns, Edward McNall (1953). David Starr Jordan: Prophet of Freedom. Stanford University Press. ↑ The Argonaut. San Francisco: San Francisco Museum and Historical Society. 1900. ↑ Samuels, Warren J. (1991). "The Firing of E. A. Ross from Stanford University: Injustice Compounded by Deception?," The Journal of Economic Education, Vol. 22, No. 2, pp. 183-190. ↑ Keith, Bruce (1988). "The Foundations of an American Discipline: Edward A. Ross at the University of Nebraska, 1901-1906," Mid-American Review of Sociology, Vol. 13, No. 2, pp. 43-56. ↑ Weinberg, Julius (1967). "E. A. Ross: The Progressive as Nativist," The Wisconsin Magazine of History, Vol. 50, No. 3, pp. 242-253. ↑ Vecoli, Rudolph (1960). "Sterilization: A Progressive Measure?". The Wisconsin Magazine of History. 43: 190–202. For my own part, I am entirely in favor of it. The objections to it are essentially sentimental, and will not bear inspection. Sterilization is not nearly so terrible as hanging a man, and the chances of sterilizing the fit are not nearly so great, as are the chances of hanging the innocent. In introducing the policy, the wedge should have a very thin end indeed. Sterilization should at first be applied only to extreme cases, where the commitments and the record pile up an overwhelming case. As the public becomes accustomed to it, and it is seen to be salutary and humane, it wil be possible gradually to extend its scope until it fills its legitimate sphere of application. ↑ McMahon, Sean H. (1999). Social Control and Public Intellect: The Legacy of Edward A. Ross, Transaction Publishers. ↑ "40th Anniversary Issue" (PDF). ACLU San Diego. Gillin, John Lewis (1937). "The Personality of Edward Alsworth Ross," American Journal of Sociology, Vol. 42, No. 4, Jan., pp. 534–542. Gross, Matthias (2002). "When Ecology and Sociology Meet: The Contributions of Edward A. Ross," Journal of the History of the Behavioral Sciences, Vol. 38 (1), pp. 27–42. Gross, Matthias (2003). "Sociologists of the Unexpected: Edward A. Ross and Georg Simmel on the Unintended Consequences of Modernity," The American Sociologist, Vol. 34, No. 4, pp. 40–58. Kolb, William L. (1948). "The Sociological Theories of Edward Alsworth Ross," in Harry Elmer Barnes, ed., An Introduction to the History of Sociology, University of Chicago Press. McMahon, Sean H. (1998). "Professional Purpose and Academic Legitimacy: Ross's Social Control and the Founding of American Sociology," The American Sociologist, Vol. 29, No. 3, pp. 9–25. Odum, Howard W. (1951). "Edward Alsworth Ross: 1866–1951", Social Forces, Vol. 30, No. 1, pp. 126–127. Page, Charles Hunt (1940). Class and American Sociology: from Ward to Ross, The Dial Press. Spellman, William E. (1979). "The Economics of Edward Alsworth Ross," The American Journal of Economics and Sociology, Vol. 38, No. 2, Apr., pp. 129–140 .